In our four most recent product reviews, we looked at three portable solar panels and one permanent solar panel kit. On this page we’re going to do a quick summary of those four products to help you decide which solar solutions might be best for you. First, let’s take a look at the permanent solar solution. 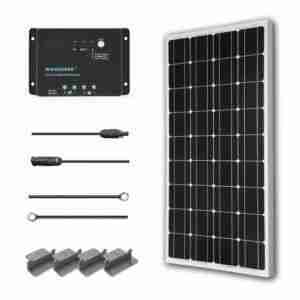 The Renogy 100 Watts 12 Volts Monocrystalline Solar Starter Kit comes with one, 100 watt solar panel as well as a charge controller and all of the hardware you need to install the panel. This kit would be a great option for anyone who wants to get started in solar power without spending a fortune. The whole kit can be purchased for under $200 and it can be mounted to the roof of your home, a shed in the backyard, or even an RV if you need power on the road. This solar setup is able to output up to 500 watt hours per day and can fully charge a 50 amp hour battery from 50% to a full charge in about three hours depending on weather conditions. The Renogy 100 Watts 12 Volts Monocrystalline Solar Starter Kit is also getting great reviews from customers online. We found over 1000 reviews for this kit and it received an average rating of 4.6 out of 5 stars. A lot of the reviews online came from people who were using this set up for RVs or off grid cabins. These customers were very impressed with the amount of power they were getting, saying that they were able to charge up a lot of different items such as laptops, camera batteries, tablet computers etc. Several customers even said that they were able to power small appliances like energy-efficient refrigerators and televisions. This portable solar panel is by far the least expensive one we have found. It’s currently available for just $19.99. This particular panel doesn’t have USB ports or some of the other features that the more expensive panels have, because it is designed to be used as a way to keep vehicle batteries charged on vehicles that you don’t use very often. For example, if you have a classic car that you only drive once a year during a parade, the All Powers Portable Solar Car Battery Charger can keep the battery charged so that the car will start right up without needing a jump. This portable solar panel features a built-in junction box with a smart charging chip. 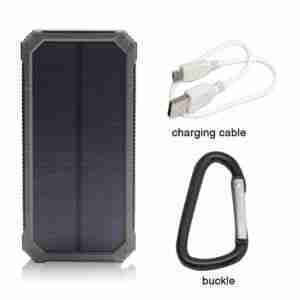 This allows you to power 12 V gear or items that can be charged with a USB cable by harnessing the power of the sun. This solar panel can also be paired with any other Goal Zero products such as power packs or even additional solar panels. 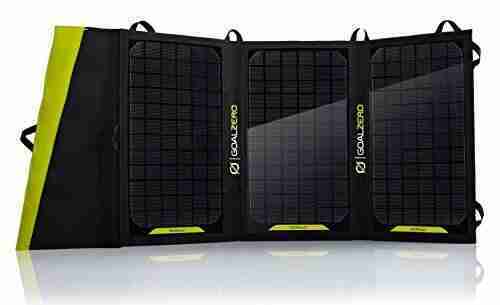 The Goal Zero Nomad 20 Solar Panel is also getting very good reviews from customers. With over 150 reviews online, this portable solar panel received an average customer rating of 4.5 out of 5 stars. Goal Zero products are a bit more expensive than some other options on the market, but most customers feel that their products are worth every penny. People are saying that the Nomad 20 is a lightweight, efficient solar panel and is a very valuable piece of gear for anyone who likes to spend time outdoors. Of course it’s not just cars, trucks, and RVs that people are using this solar panel for. Some people are using it for tractors and yard equipment. 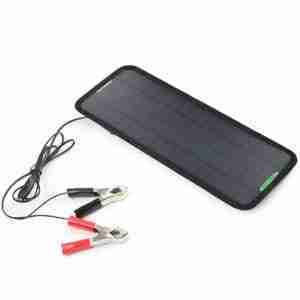 The All Powers 18 V 5 W Portable Solar Car Battery Charger Bundle seems like it might be a good option for people who have vehicles or equipment that sits idle for long periods of time, but the reviews it’s getting from customers could be better. This product received an average rating 3.9 out of 5 stars. Some customers had problems with it, but others feel that it is a decent quality item, especially considering its incredibly low price tag. The iBeek is another inexpensive option with a price tag of just about $22. It’s not just a solar panel, there is also a built-in 12,000 mA hour battery with dual USB charger ports. This device also comes with a carabiner so it can be clipped onto a backpack while you’re hiking through the woods. It is impact resistant, rainproof, and dust proof so you can bring it with you wherever you need to take it. Although the iBeek Portable Solar Battery Charger seems to be a very handy, portable solution for charging things like smart phones and tablet computers, the reviews for this device are somewhat mixed. There are hundreds of reviews online and it received an average rating of 3.7 out of 5 stars. The majority of reviews are positive and most people are happy with it, but there were a number of people who pointed out problems with it. With such a small price tag however, it may be worth giving it a shot.